Okay so this is a skill we probably all need! Sometimes you have to play when you aren't feeling your physical best. I played twice this weekend and am recovering from the good old fashioned flu (thanks, middle schooler who brought this nice bug home to me.) I am better and figured I'd be okay to just kind of gut it out, but turns out I am weak as a kitten. Ugh. So on Saturday, I played a lady I've played many times before. I'd say we are pretty equally matched in skill but she is ranked higher than I am per TR and she has never beaten me in the 8-10 times we've played previously. I easily won set #1 (6-2) but then just ran completely out of gas AND she figured out something was going on with me. So set #2, the way my tiredness was coming out, I could still run down every ball, but my shots had zero power, I couldn't follow through, couldn't even hit a full stroke. It was bizarre. So we ended up having to play a set tie breaker followed by match tie breaker which she won. Oof. I went home and slept for the rest of the day. The second the match ended, as we shook hands, she was like, "What happened? Did you get nervous and play not to lose? You seemed so tentative." So I think that's how my shots came across to her from the other side of the net. So then I had to play Sun too. Feeling about the same physically BUT I decided I was going to just own being a pusher, not even try for power, really work on placing my serve and placing my shots well. Also she had an itty bitty serve so I did some return & volley. She was not very good and I should have easily won 6-0 6-0 but instead did win but 6-3 6-2. I need to develop an idea or game plan for playing when I'm physically not well, or tired, or whatever. Like I think shortening the points? I think my mistake on match #1 was I started out just thinking I could play my regular game and push through, and I should have started out with an energy-conserving strategy from the first moment. Anyway, whew. And maybe the best strategy is to avoid playing when sick whenever possible! Did you look something like this? Ew lol no, fortunately my symptoms were mostly above the neck (other than total exhaustion.) Stomach is the worst! Having done it ... I would say "don't play sick" unless there is real $ or serious glory on the line. Maybe because I am such a head case, I would think that the memory of a poor match would linger with me and then effect my future play. Good job on making some adjustments though! Here’s an idea, if you have the flu bug just stay home. 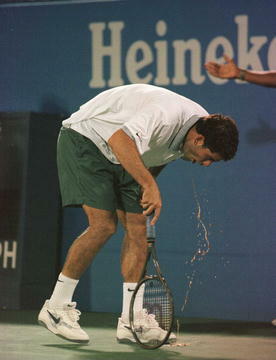 People don’t want a sick person barfing on the tennis court and no playing with the flu is not a skill. What are you trying to prove? I probably play my best if I'm modestly ill. Probably because I drop my expectations and head into survival mode. Somehow that frees me to go for points. I agree. there have been matches where I tweaked a sciatica or groin, and suddenly can't move as quickly as i'd like, so then it's just all about freely hitting the ball to get the hell out of there...and whaddya know...i'm suddenly up a break! End of season, don't want to forfeit lines so had to play:-( I feel a sense of obligation to my team especially since I'm the captain. LOL ... totally get it and have done it ... just best to avoid where possible! I have a lot of respect for people who don't play sick so they don't pass it to partners or opponents. I played too soon after starting ketosis. Wasnt fully fat adapted. Cardio wasnt built up enough. Didnt drink enough water / salt. And it was 112 degrees that evening. Initially I was enjoying the challenge. Deep into the second set I was convincing myself I was a warrior. Dumbest **** I ever did. My game started to deteriorate pretty quick. I lose the 2nd set to a 3.5 guy I normally beat. Into the 3rd set and Im starting to lose motor skills. Having trouble keeping score. Balance is off. But I trudge on for the challenge of it. Again, incredibly stupid. 6 games in I realize Im in really bad shape. I ask if I can quit the match. My opponent happily obliges. He thinks Im certified nuts at this point since he wanted to see me throw in the towel after the first set. Took me 30+ minutes to drive home due to how slow I had to drive. Pulsing headache. Definitely not safe. If I didnt have a heat stroke I know I came damn close. Spent a long time in a cold shower. I can handle sports in the heat really well. I way overdid it that time. Hoping I didnt cause permanent damage as Ive read that you can ruin your ability to handle heat. Attack the net and either get passed or put away some volleys. If lobbed, hit OHs for winners [or errors]. If I had to play, my priority would be getting off the court and back in bed ASAP. If I happen to win, so much the better but it wouldn't be my priority. If you feel well enough to play, it either wasn't flu or you were sufficiently recovered so as not to be contagious. I once caught the flu from someone who played a league match sick. Had to shake hands, had to use the same balls, etc. They would cough right into their hand and then toss the ball. Do not do this. If you have the flu, stay home. You aren’t proving anything. Rather, you are a public health concern. Have some respect for others. We can agree to disagree referencing the post right above. Playing when sick is a great idea. You have low expectations and will be very relaxed and your strokes will flow. A few subtle reminders to your opponent about your sickness will put pressure on him/her, while you have the perfect excuse to lose. Other things I did while sick include: closed two major business deals; made a speech at a black tie event for 250 people; cleaned out a hoarder house for my real estate business. I also went to BNP Paribas and sat in the sun:-( I'm a busy mom and don't know when to quit. I think pneumonia is a sign from the universe that even I have my limits. Sick in bed today! Other things I did while sick include: closed two major business deals; made a speech at a black tie event for 250 people; cleaned out a hoarder house for my real estate business. Hillary had pneumonia and lost the electoral college! In all honesty, I've played some of my best tennis when either sick or hung over (granted, this was when I was a spry 30 yr old...things might be different today). Had an issue with this just this past weekend. Match time was 9 AM, about a half hour drive away - woke up at 7 (after being awake multiple times during the night with GI issues) hoping my overnight distress would be gone - but it was not to be so... too late to bail out on the captain - if I just tell him I can't play, and don't show up, we'll default this line, and all lines below it because it's too early now to get anyone else to arrive in time to play the line, but if I just retire, we only lose that line but I have to show up to retire... so I go to the match, tell the captain how I'm feeling and that there's a fair to middling chance I may have to retire during the match. If he's got someone available to jump into my spot, great, but otherwise, I'll give it a try. During warmups, I'm kind of shaky - but I am trying to be super deliberate with my footwork and focus - no real strength in my movements or strokes though, legs and feet feel like they weigh a thousand pounds. I start to loosen up my serve and go for a big hard serve which requires me to get my core involved. My stomach warns me in no uncertain terms that if I do that again, it's going to be a spewfest... and those pics above with Sampras booting are all I can see in my mind's eye... so all I can do with my serve is to spin it in - no heater today. Quick trip to the restroom after warmup, back on court with a white face and beads of sweat on my forehead NOT from the temperature or the effort I've expended so far in warmup. We start play and things are decent at first then we're rolling and take the first set 6-2. OK, I'll stick this out! Second set rolls around - my legs are GONE - my serve is broken for the first time in a long time - we rally and bring it back on serve at 4-5. My partner is serving, I do a miserably poor job of trying to help him hold it and fail... we lose second set 4-6. Third set - no sense retiring now - let's play it out... hold my next serve game to love... OK! Looking good... then the body fails me again - I can't muster the energy to chase down easy lobs or really even move on court at all, they are hitting away from me or over me at the net, and when I'm back, they're running me around, wihch I am unable to do. Finally I'm serving again at 4-5 and have the most miserable serve game I can recall - we lose 4-6 and lose the match. My partner has been doing his best to cover my shortfall and it has impacted his game as well... it's just ugly. He's very gracious about it all though. Afterwards, I head home and spend the rest of the day and most of Saturday night into Sunday morning running back and forth to the can. All in all, I'm glad I at least gave it a try, but we really should have won that match and based on my normal level of play, I feel sure we would have done so if I'd been healthy and able to carry my own weight. You should have pulled the trigger and purged and served big.